When Kelli was three, we lived in a much-loved home affectionately called “the gray house.” We nicknamed it “the gray house” because the house was in fact, gray. We had moved across the parking lot from the not-so-much-loved green house. The green house had one bedroom and a fire-trap attic which we converted into a second bedroom. It also had a living room, a rather small, dark kitchen (until we painted it orange and yellow) and an unheated bathroom which guaranteed no one spent too much time showering or getting ready during the winter. Kelli’s window looked out onto the branches of a pine tree, so close, you could touch them when we opened the windows. And it was right there, on that close-to-the-window branch that a mourning dove decided to build her nest that spring. Kelli was excited about this as only a three-year-old can be about a bird so close to her bed. During nap time she would lie on her blanket and stare at the mourning dove and the mourning dove would warily stare back at her. Days went by and we were excitedly waiting to see the baby birds hatch and then grow big enough to take off into the cruel world full of cats and other dangers. This was a front-row seat to a homeschooler’s dream visual. Then one sad afternoon, (Kelli was once again lying in her bed, watching the bird instead of napping) a hawk somehow spotted the mourning dove and her about-to-hatch babies. With one swoop, he was down – attacking. The mourning dove screeched her lamentations, but the mother and her eggs had been destroyed. And now, we’re watching another mourning dove. 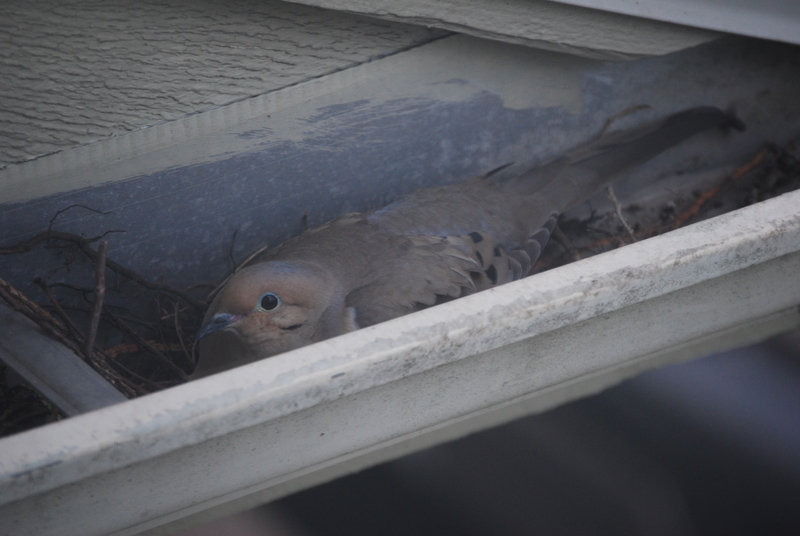 She is nesting in a very secluded part of the gutter – fortunately not a part that is needed to actually drain rain. Actually she has chosen wisely. Could a hawk spot her? Yes, but I think he would have a problem getting at her. Unfortunately, squirrels are also predators and as we all know – there is a squirrel who likes living on the roof. In fact, one was just par tially hanging upside down from another part of the gutter, looking at me through the window. (Which would’ve been funny if it hadn’t been that annoying squirrel again.) I think the squirrel has already demolished the grackle nest in the tree, causing the grackles to move to my neighbor’s yard. (Not really a problem when it comes to grackles.) Hopefully the squirrel can’t figure out how to get to the dove. I assigned the munckins a story about the mourning dove in their writing class and the 9yo named her Ellie – which will make it even more difficult to have the dove and her babies destroyed. But for now she is curled up in her corner of the gutter and she is safe. Ellie, I hope you stay that way.